The Cult are the insane followers of the enigmatic Burning Man. The forces of the voiceless entity are made up of monstrous aberrations and humans touched by the chaotic magics that lie between worlds. A Cult of the Burning Man army specializes in hit and run tactics and using magic to defeat their foes. The Cult is defined by chaos and portals, and their Allegiance card shows this off clearly. 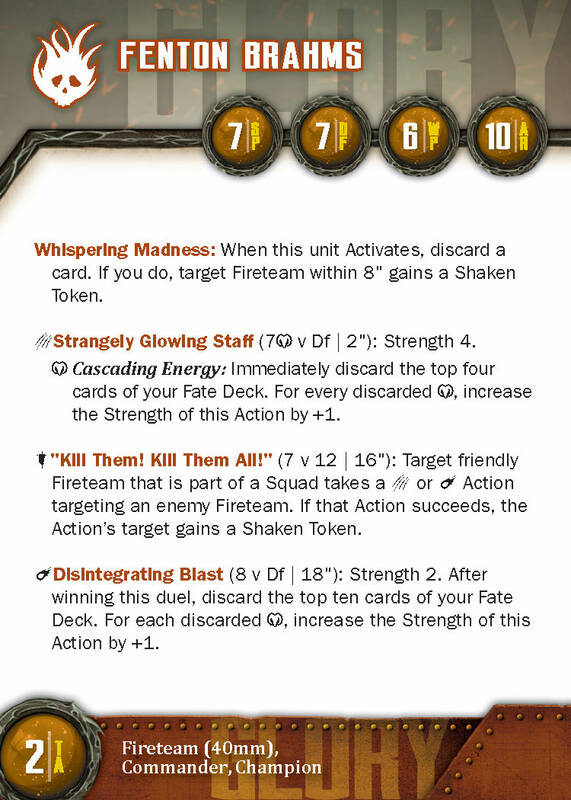 They are capable of passing out Shaken Tokens based on discards, which they can use to try to Glory their own units (because being crazy helps them) or to impede their enemies. The most impressive part of their Allegiance, however, is Dimensional Instability. 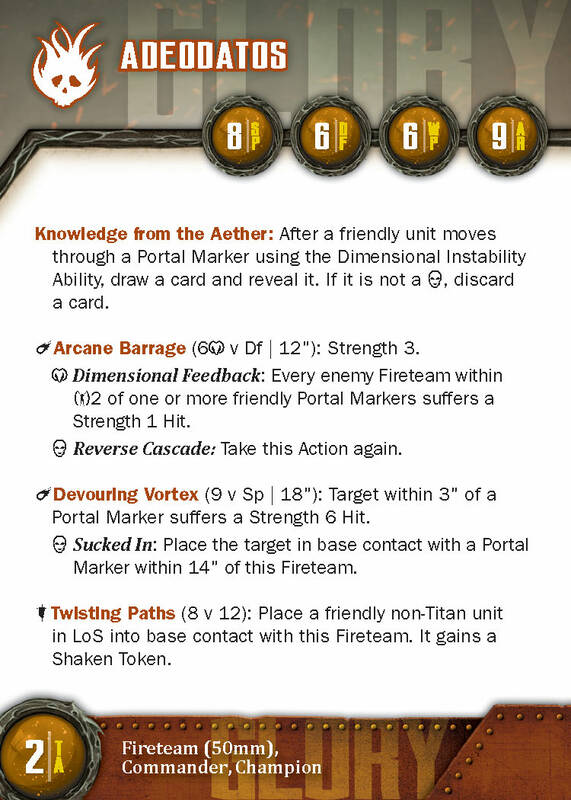 They are able to place 3 Portal Markers on the table, which they can step through to go to any other Portal Marker. They can even move these with Tears in Reality. The Cult's Portals open up the entire playing field, and one never knows where they might show up next. When in Glory, Adeodatos' Arcane Barrage gets a trigger to let it attack twice, but his most crushing change comes from the addition of Devouring Vortex. If an enemy is near one of his Portals, Adeodatos can hit them with a massive Strength 6 hit (at a ludicrous AV 9) and then force them through the Portal. Suffice it to say, it is devastating. When you're playing the Cult, you recognize that chaos is your friend. Fenton is comfortable with this -- you can trade cards in your hand for enemy Shaken Tokens, often giving efficiency to friendly troops. At home in melee, Fenton's Staff is a powerful tool, but his specialty is whipping his adherents into a bloodlust for his foes. Screaming at the cultists, he can get them to attack and give out Shaken Tokens as the enemy realizes the zealotry they are up against. If you're wondering what really makes Fenton tick, however, look no further than his Glory side. A new trigger on his Staff can lend it (potentially) incredible Strength. But where he really shines (or potentially doesn't shine at all) is his Disintegrating Blast. At an 8 versus Defense, the action is likely to succeed. An impressive 18" range means he can cover a lot of ground with it. It may only be Strength 2, but it makes you discard an amazing ten cards off the top of your deck and every Ram adds to the Strength. This action could reach over Strength 12! If you ever wanted to vaporize something, Fenton is the way to do it... if you're lucky. Who doesn't love big monsters? Horomatangi is the biggest and baddest monster this side of the Breach. He is a beatstick of a commander, able to dish out massive amounts of damage with his base actions, as well as his powerful Asset, Flaming Breath. His Superheated Claws and Scalding Spurt give him a high Strength attack both in Melee and at range. Meanwhile his Bellow of Command means he can easily buff his troops, whether they are Cult or Gibbering Horde, and debuff the enemy. Horomatangi has a lower Defense, but makes up for that with his astounding Armor of 12. This means that even without the Champion special rule he is still quite hardy with the 3 Assets he can bring as a Titan. Once Horomatangi flips to Glory he gains access to the Mighty Willpower Morale Action which allows him to take any other Action on his card, and has a trigger to also let you take one on an assett. This makes Horomatangi a commander who is capable of amazing versatility. The Warped are some of the Cult powerhouses, bringing impressive attacks and mobility. Even their toughness is above average, particularly if they have not yet activated for the turn. Their Twisted Claws are their go-to action, an impressive AV 6 and Strength 4 supported by two good Triggers. Echoes of Existence can get them where they need to be, allowing the two remaining Fireteams to take their Twisted Claws actions. The Twisted Horrors are able to soak up quite a bit of punishment. Armor 7 is strong, particularly when coupled with a Defense of 5. Add on their Impossible Physiology and they have a 25% chance of getting the Reinforcement Token needed to replace lost numbers. Of course, no damage soak is complete without pumping out some damage of its own. Everyone loves a good Tentacles attack, coming in at a respectable Strength 3. Though the AV is not amazing at 4, the possibility to trigger into card draw cannot be ignored. Finally, Cascading Magic is a ranged magical attack that, if you were lucky, could hit at up to Strength 5. Worship your Burning Man and perhaps fate shall favor you. The Cult of the Burning Man has lots of ways to engage in some unexpected movement around the board. The Doomseekers make this even more effective with their Translocation Ritual. Their offensive capability is mostly in their Arcane Blast, which has a decent AV of 6 with a Strength of 3. The real power of this attack is a huge (for the Cult) range of 16" and area. This allows them to pepper the enemy before the more Melee focused units hit the front lines. The Broken are the cheap tarpit units of the Cult. Their Without Number gives them a chance to get a hold of more Reinforcement Tokens, and potentially trigger the Chaotic Power Allegiance Ability. This combined with their Reserves (2) ability means that they will be a tough unit to remove despite their lower Defense and Armor. 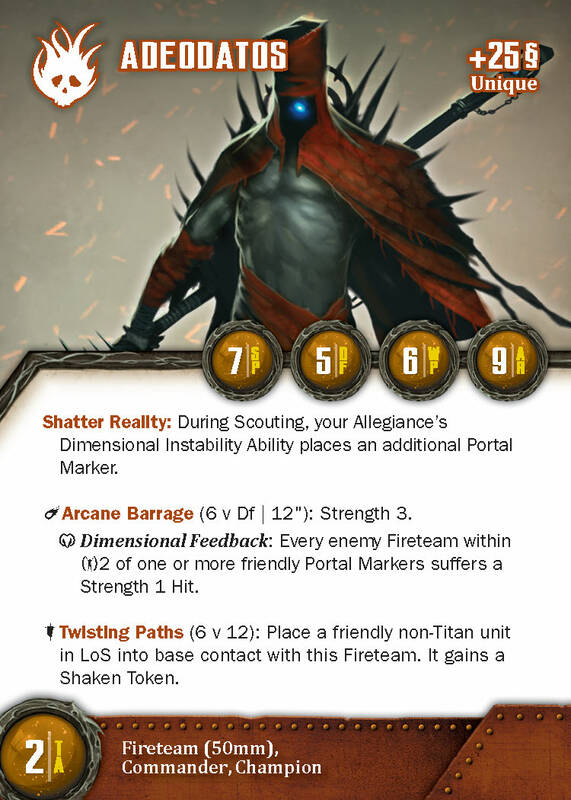 Crazed Ramblings gives you even more opportunities to use the Chaotic Power Allegiance Ability, while also allowing you to draw a few cards. The ECB Black Ops are a set of Rogue Agents which means they get to work independently, while deploying anywhere on the board. This with their Webley Mk IV Revovlers and it's Precision Trigger means they will be able to prove a major threat to any Champions. In Glory is where the ECB Black Ops get...weird. Their Knocking Down The Pillars of Reality Action can affect a huge portion of the board, but requires some pretty intensive set up. When you pull it off though, you will truly feel the power of the Burning Man course through you. The Breachling is a single model Fireteam that makes it easier to use the Chaotic Power Ability with their The Silence Between Dimensions. Their Fearsome Jaws give them a decent little attack that can move them around the table, while Wild Thrashing can surprise you with it's damage potential. Their Glory Side turns the Breachling into a living bomb, delivering a Strength 5 hit to all Enemy Fireteams within 6 inches. This can be quite powerful combined with their ability to get where they need to go. The Immolated Rhino is a poor animal who was corrupted by the magics of the Burning Man. Its Consumed By Magic ability means it can be quite tough to bring down unless your opponent is willing to dedicate some cards to bringing him down. While the opponent tries to bring this mighty rhino down, it will be using it's Immolation Horn and Fire Nova to cause a massive amount of destruction across enemy forces. The Goryshche is a massive, twisted creature. Like the hydra, it spouts many heads and the ability to quickly replace that which it has lost. This means that while the Goryshche is easier to hurt than most Titans, it is also better able to withstand prolonged assault. Its Hungry Maw action is a potent attack at Strength 4, and it puts a great amount of fear into the enemy. It can also be used, with the Swallow Whole trigger, to deal a great amount of damage to an enemy Champion -- particularly a Commander. This is not the sort of creature you want to have as your enemy.